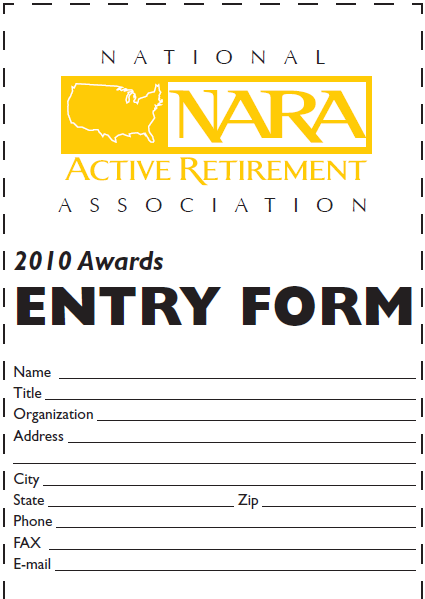 The 2010 NARA Awards will recognize those projects and efforts focused on meeting the demands of active, mature adults across the country. Projects will be reviewed and judged on their ability to meet basic project parameters of age-qualified and age restricted housing, such as market demand, aging-in-place design, budget and services. Promotional materials will be judged on originality, design flair, creativity and ability to meet targeted objectives. (Age-qualified means that a community is designed at least partly with a 50+ person in mind and has features that appeal to an older consumer. Included, of course, are all communities restricted to people 55+). All entry applications, fees and photographs must be received not later than 12 noon on Wednesday, September 22, 2010. The deadline is final. 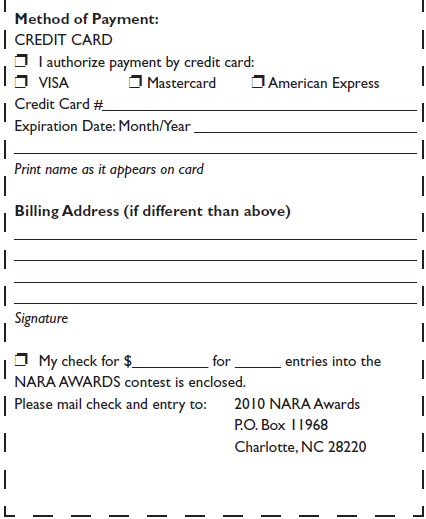 The entry form (appears at the end of this Call for Entries) and appropriate entry fees must be mailed in advance to NARA Awards, P.O. Box 11968, Charlotte, NC 28220. Please make entry fees payable to NARA. If you have any questions, call the NARA offices at (888)742-7362 or fax your inquiries to (704)631-4629. All entry materials will become the property of NARA and will not be returned. $65 per category per entry. Completed Entry Form and Entry Fees. Description of your project. This must include a location plan, showing the site in relation to its surroundings. Also include a layout plan, with north point and scale clearly marked and showing the relationship of the project buildings to all other buildings and landscaping on the site. The extent of the project should be outlined in red. Photographs of the existing project (if available) to the extent that judges get a good feel for all phases of the development and the scope of the development. A 300-word summary of the development, including aesthetics, building process, amenities and any other thought process that was considered in producing a superior project. Three samples of the advertisement, including video, tape or print advertisement. A 300-500 word description of how the advertisement was used, what objectives were sought and what results were achieved. A 350-500 description of the objectives met, results achieved and accomplishments gained while this person has worked for his/her organization. Any anecdotal evidence supporting this person, including obstacles overcome, growth in his/her position and exceptional effort committed to being successful is encouraged. This award will be given based on achievement that is deemed exceptional for the industry, company and the development. Each entry will be judged by a panel of distinguished and experienced members of the active adult housing, homebuilding and and/or retirement housing industry. Judges will consist of NARA participants and speakers who have been engaged in the industry. Gold, Silver and Honorable Mention Award winners will be announced and recognized at the 2010 NARA Conference at an awards reception. All winners will be notified in advance and are encouraged to be present at the awards presentation. *Note: Gold, Silver and Honorable Mention Awards may or may not be awarded in every category, at the discretion of the Judging Committee and NARA Officials and based on the number of submittals. Below, please find the required materials to include with each submission. All fees for each entry must be received before the final deadline.